It’s that time of year again! The weather is getting colder, winter jackets have been brought out, mugs of warm apple cider fill our tummies, and neighborhoods are glowing with decorations. It’s a beautiful sight to see. It’s also a time for family and friend gatherings, and for some people, it’s the perfect time to celebrate love by getting married. With that being said, a wedding in the winter is a little different than other times of the year. There are so many amazing ideas for creating a warm, cozy atmosphere for your winter wedding. Here are our ten favorite winter wedding ideas to give your big day a special touch. Coffee or tea is fairly commonplace at most weddings after dinner, but why not go a different route when offering your guests something warm? 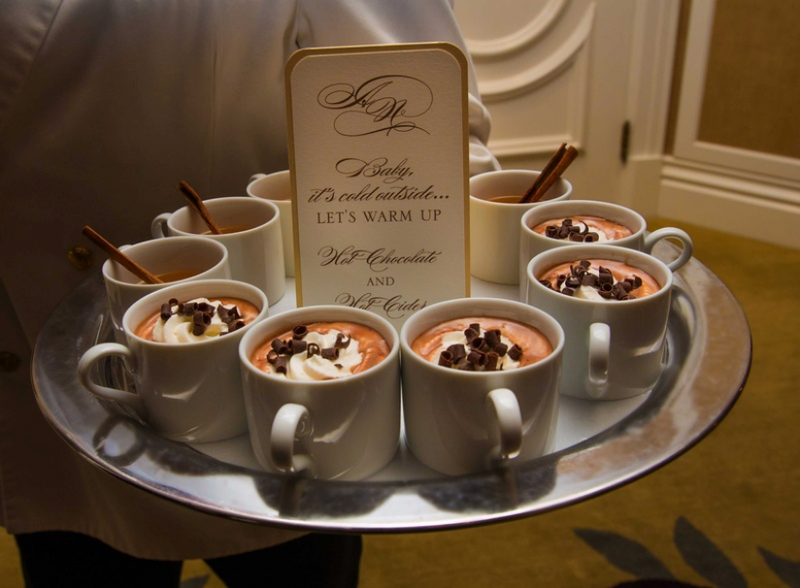 A festive cup of hot chocolate or warm apple cider will provide your guests with a very cozy feeling that will set your wedding apart from the rest. Soup is often ignored during weddings, even though everyone loves it. If you’re having a winter wedding, however, soup will be extremely welcome. There’s nothing like rich and creamy soup to chase away the winter chill. Make sure to check out the best soups for a cold day. Your guests will love you for this! Want to give your guests a wedding favor they’ll actually use? 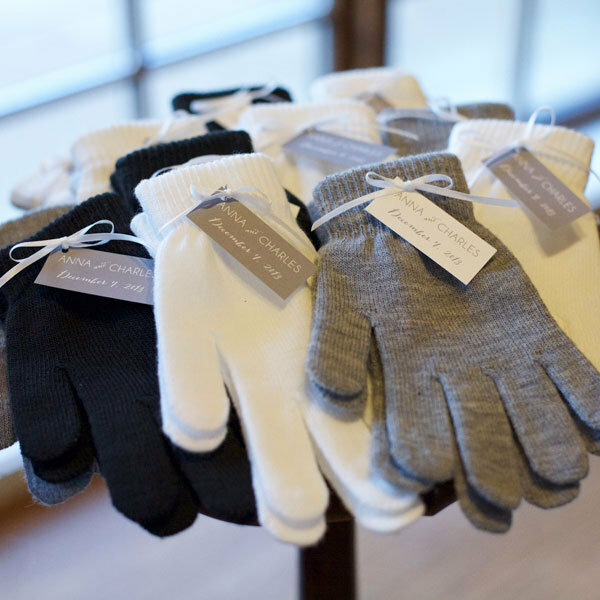 Keep their hands toasty by giving each guest a pair of winter gloves to take with them! Every time they put this pair of gloves on, they’ll remember your gorgeous winter wedding. A perfect way to encapsulate the feeling of being warm and cozy is to add candles to the reception tables for your guests. They provide a warm glow reminiscent of sitting in front of a fireplace. Be sure to speak with the owner or manager of your wedding venue to make sure that they’re okay with candles. They make a truly great touch, and continue to be one of our top favorite winter wedding ideas. 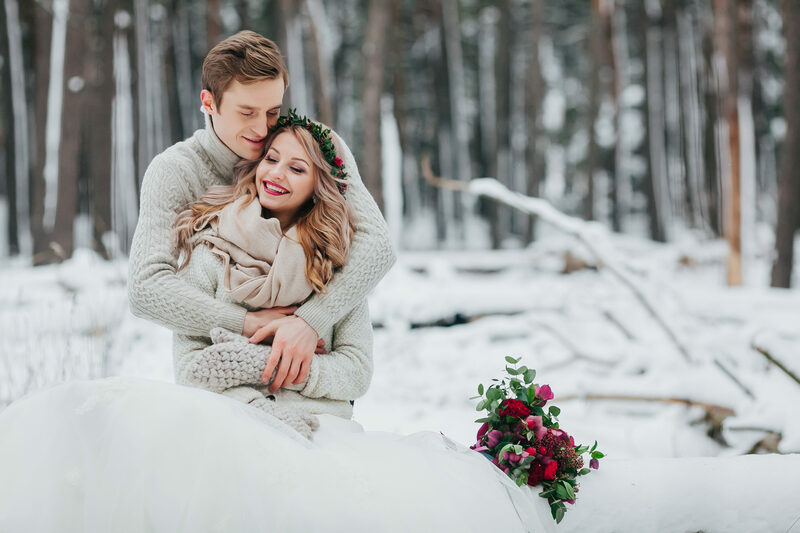 Want to offer your guests an opportunity to be extra cozy at your winter wedding? Warm them up by having a blanket station at your venue. If any of your guests are feeling chilly, they can go grab a blanket from the station. And if you really want to splurge, you can even have the blankets embroidered with your initials. Another fantastic way to create a warm and inviting atmosphere for guests is to make a lounge area with comfy couches, a plush rug, and seasonal centerpieces. If you’ve got a large event space like ours at Imperial Event Venue, you can take a corner of the room and turn it into your very own “winter cabin” to give off a great cozy-winter vibe to your guests. We mentioned giving gloves as one of our winter wedding ideas, but if you’re not into that idea, why not offer your guests scarves as a wedding favor instead? 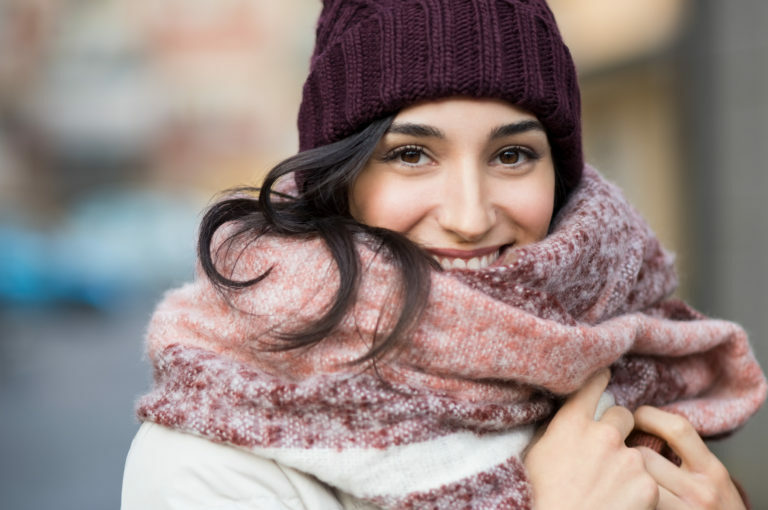 Scarves are both a practical way to keep warm and an awesome fashion statement. If you’re thinking about using candles in your winter wedding décor, why not combine them with lanterns? Lanterns with candles inside will give off a warm glow, creating a cozy setting and atmosphere for your guests. Lanterns make incredible decorations because there is so much you can do with them. You can have mini lanterns at each table, or have them arranged all around your venue. Your ability to decorate with them only stops with your imagination! 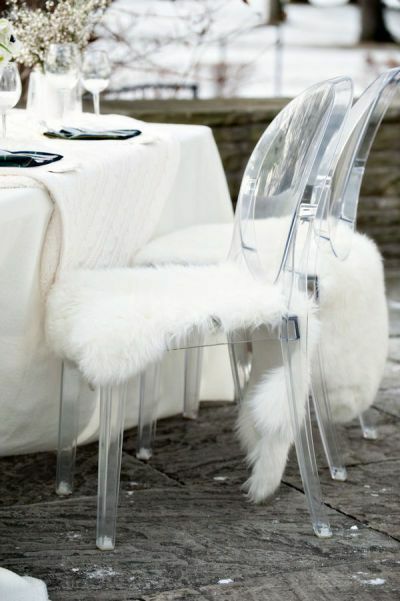 Invite your guests to be seated on fake-fur seat throws! This not only looks wintery and cozy, it will also keep your guests toasty and comfortable throughout the entire evening. At Imperial, we love when our guests try something unique and interesting with their menu. Our world-class catering service loves a good challenge. For your winter wedding, why not try incorporating seasonal flavors? We will work with you to create the ideal winter menu. Try using flavors such as cinnamon, apples, vanilla, cloves, cranberries, and much more. It isn’t always easy having a winter wedding. Depending on where you live, you may have guests battling through snowstorms just to get to your destination. But creating a cozy and warm environment for them will help set your wedding apart, and will carve a memory out in the minds forever. Hopefully some of these winter wedding ideas will help transform your special day!